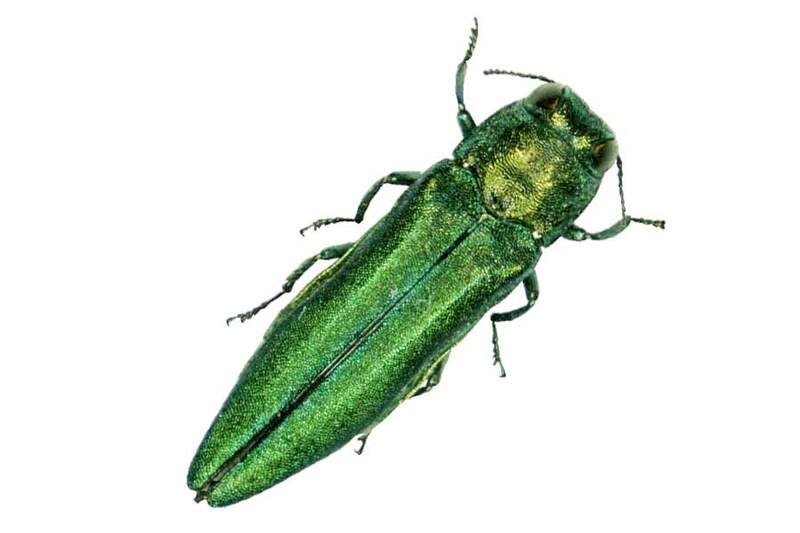 The emerald ash borer, Agrilus planipennis, is a destructive, non-native insect that kills all species of ash trees. First discovered in Michigan in 2002 it has spread to thirty-three states and is confirmed in all six of the Chesapeake Bay watershed states. 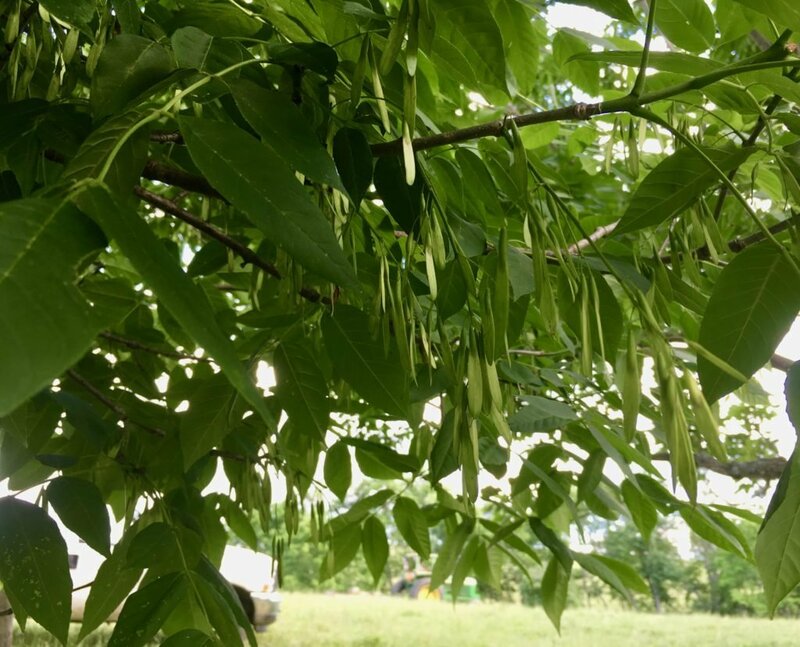 They have arrived in Augusta County, Virginia in full force, infecting one of the most important riparian trees in the Chesapeake Bay watershed – green ash. To my chagrin, they are killing the ash trees on our farm. Healthy green ash tree with seeds. The seeds are dispersed by gravity, wind, and water. Photo by R. Whitescarver. This is bad news for riparian forest buffers; it’s one our best trees because it populates on its own and is fast growing. At a time when many more acres of riparian forests are needed, we are losing a first string player on our riparian forest buffer team, but we have a deep bench. Read on. 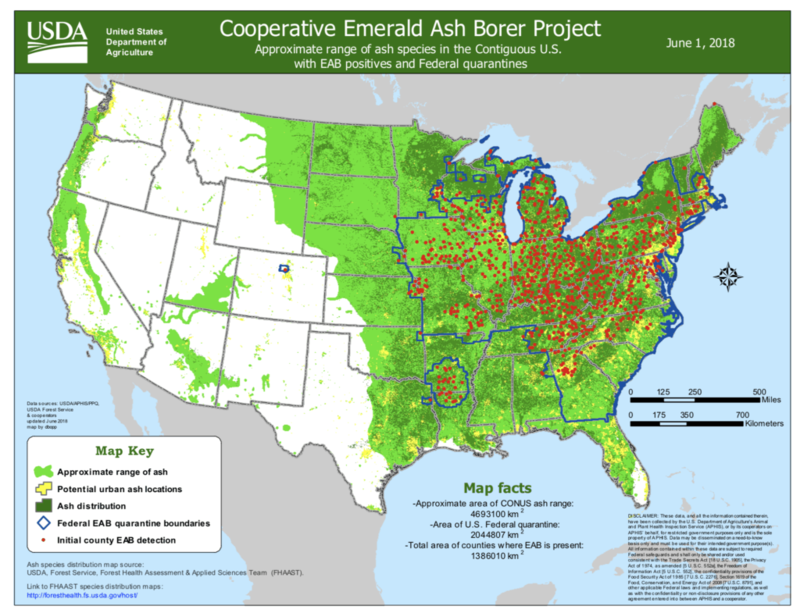 Adult Emerald Ash Borer, photo from the Arbor Day Foundation website. 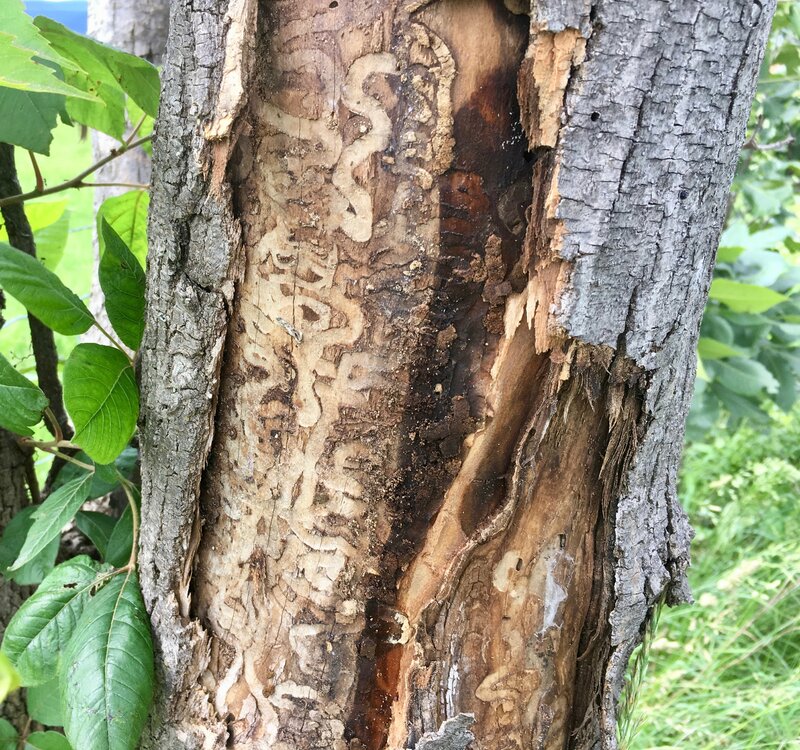 I first learned of emerald ash borer (EAB) destruction in Augusta County when Joe McCue and I were doing maintenance work on a riparian forest buffer along Middle River near Weyers Cave, Virginia. We walked along the rows of towering trees, pruning the lower limbs, removing shelters as needed and removing invasive species. The green ash trees didn’t look too good. This is a ten-year-old hardwood tree planting along Middle River in Augusta County, Virginia. The photo was taken in May of 2018 by R. Whitescarver. The main stems of the green ash were dead on ninety percent of the trees. These dying trees had some sprouting around the lower part of the trunk. This is called epicormic sprouting. It happens when the tree is on its last leg of life. Young Green ash infected with Emerald Ash Borer. The larvae eat the cambium layer of the tree beneath the bark, therefore, cutting off the flow of nutrients and water to the branches. This photo was taken in June of 2018 by R. Whitescarver. Pictured here are Joe McCue of the Friends of Middle River, Sarah Hagan and Patti Nylander both from the Virginia Department of Forestry. The larval stage of this destructive pest eats the vascular system of the tree, therefore, cutting off the flow of nutrients and water to the rest of the tree. Emerald ash borer damage. The larvae eat the vascular system of the tree. This photo was taken in June of 2018 by R. Whitescarver. This tree is on our farm in Swoope, VA.
Another tell-tale sign of EAB infestation is the distinctive “D” shaped exit hole they leave when the adult emerges from the tree. Emerald Ash Borer exit holes in green ash. How many “D” shaped holes can you find? Those fingers are Sarah Hagan’s. She is the Riparian Buffer Forester for the Virginia Department of Forestry. Photo by R. Whitescarver. 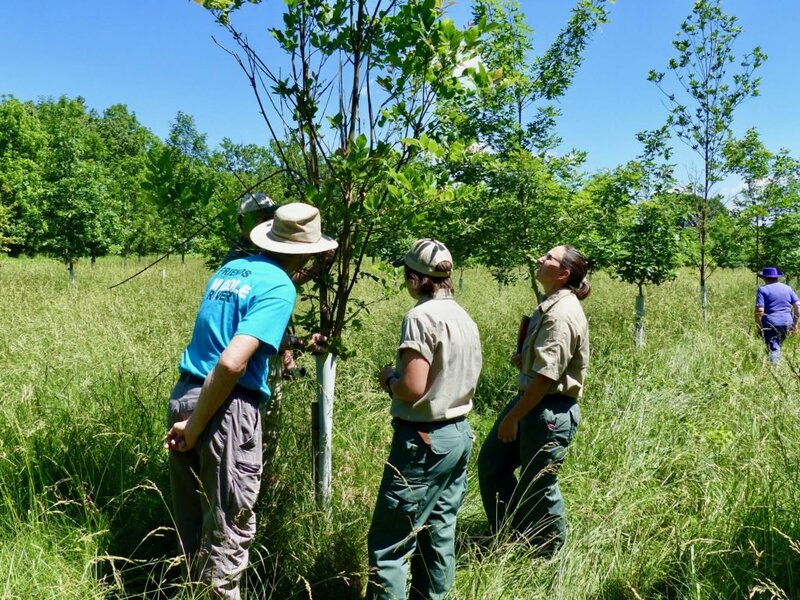 Green ash trees are one of the most important trees along streams and rivers. They are called pioneer trees because they are one of the first trees to naturally populate areas along streams. Their seeds have developed to be transported by wind and water. There is not much we can do at this point. For specimen trees, there are systemic insecticide treatments available. Scientists have found several beneficial wasps that parasitize the EAB and field trials have been successful. There is one thing we can do: encourage and plant other native trees. Diversity in tree populations is very important. Other pioneer species include sycamore, box elder, red maple, black locust, and catalpa; encourage these trees by not mowing them down. 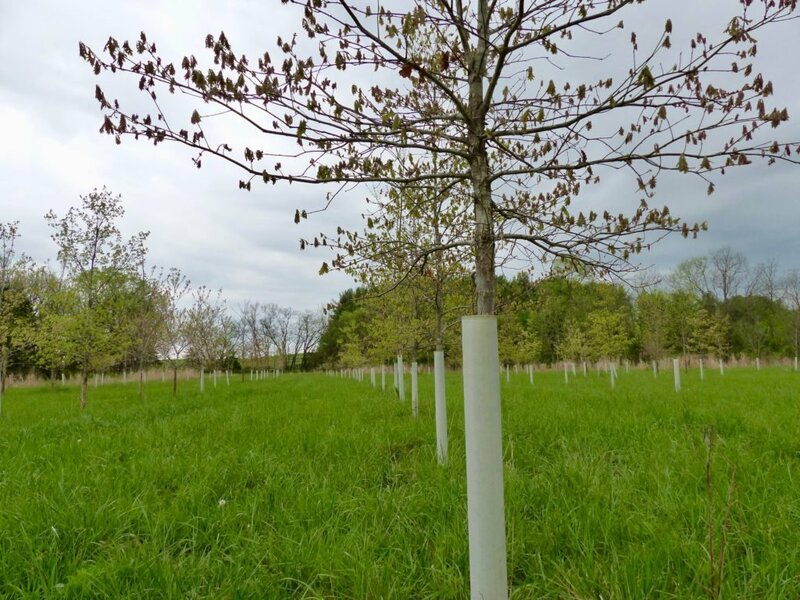 Plant these and other trees such as willow oak, swamp white oak, pawpaw, river birch, and other suitable trees for the site and soil. I learned a great deal about the EAB from the professional foresters in the Virginia Department of Forestry. For more information about establishing riparian forest buffers contact me or your local Forestry Department. The Animal and Plant Health Inspection Service of USDA has a great website on the EAB. 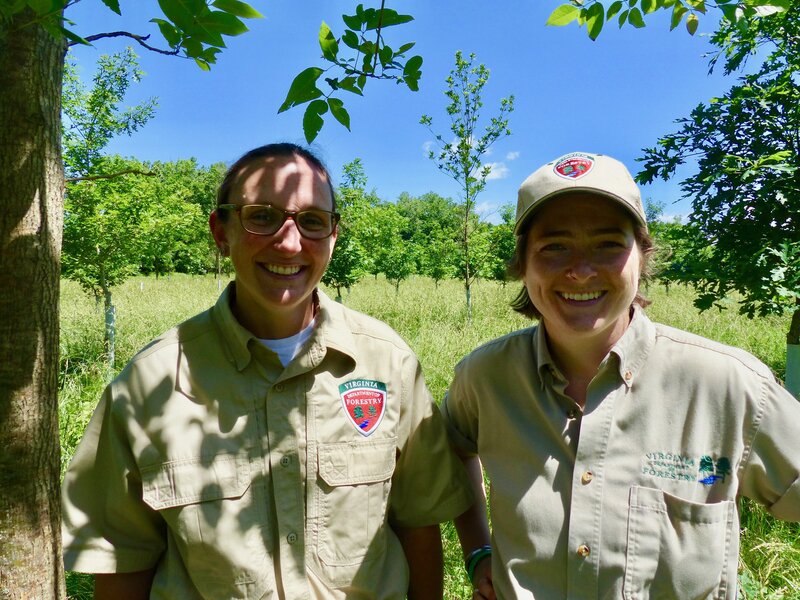 Patti Nylander is Senior Forester and Sarah Hagan is Riparian Buffer Forester for the Virginia Department of Forestry. Photo by R. Whitescarver. Yes, sadly, the ash borer is in Keezletown too. I have a dead tree in my yard and others on the farm are dead or dying. Ash will serve as firewood for a while. We will have to learn to live with this pest just like learning to live with the mountain pine beetle out west. If a few trees prove to have resistance perhaps the ash can recover from a new genetic stock. I have yet to hear that there is any resistance in the species have you? Wayne, thanks for your comment. I have not heard of any resistance. There is some good news on the biological control front. Wasp larvae have been found that eat the EAB larvae. Early trials in Michigan have been successful. The APHIS link has some good information about it. Thanks, Bobby, for the heads up. When the beavers attacked the ashes in the Wheatlands CREP area a few years ago I thought perhaps the trees might resprout from the stumps, but they didn’t. I guess we will have to see if the bugs leave any life in the stumps they create. As you say, diversity is our friend. The volunteer sycamores are doing well and the planted oaks, but they are slow growing. There’s a grove of catalpas spreading downstream from the single parent tree that survived the era when cattle had access to Middle River at Wheatlands. BTW, beavers evidently have no interest in the sycamores and I sure hope something else doesn’t take a liking to them. Thanks, Michael. Diversity is indeed our friend. We lost two giant sycamores to anthracnose and stress. The Red-headed Woodpeckers like them a lot. That borer has absolutely devastated the Piedmont area around here as well as the Northern Shenandoah Valley. I now know a little of what it must have been like to watch all the American Chestnut trees gradually die out over a decade…..
My woryy is that when that little SOB eats all the ash trees, will it jump species? There will sure be many little hungry bugs looking for something to eat. I’ve becomed somewhat inured to the site of the bark on these dead ashes. It’s quite distinctive like whitish scabs all over the trunk. I see some of that on other trees and worry that they will jump species. The honey locusts , another succesion species around here, are also dying over the last dozen years. They show the exact same scarring pattern under the trunk that the ash does. It’s not the borer though, I noticed it before the borer really got going up here. I suppose it’s all part of an ongoing process that’s been supercharged by the globalization of the world over the last 100 years…Progress, I guess. Thanks for your post, Amigo! George, thanks for your comments. Ah, globalization and homogenization of the Earth. In the end, it will just be grasshoppers and fescue. We proceed on. I am in Tazewell county, Va. My ten+ year-old ashes are all dying, their bark resembles the pictures shown. I will try insecticide on remaining trees. Thank you for information. Allen, thanks for stopping in with your comment. I’ve had the borers in the ash trees in my yard at least all last year, if not the year before. Lots of dead limbs last year, and we have the epicormic sprouting this year. Firewood it is. Holly, thanks for posting your comment and sorry for your loss. On my 12 acres in Hampshire Co. WV along the Cacapon River, we lost them all. Was able to retrieve something by having the ash timbered while they still had some value for pulp wood. They took 15 timber truck loads… Didn’t realize they had made it this far south. It a real shame. Thanks for the info. Pete, good to hear from you. Thanks for your comments. Sad article, but good advice. Your efforts to educate are appreciated. Thanks for your comment, Charlie. We have just had two large ash treated by injection with hopes of a good out come. We started treating our hemlocks in 2000 and managed to save two large ones out of three. So we remain optimistic. Thanks, David for posting your comment. I hope your trees make it. You have some very large trees! My prized ash, prominently planted maybe 30 years ago between the house and barn, was infected about 10 years ago, and despite frequent spraying with an anti-borer agent, the tree succumbed after a year or two. Same with the ashes in our woods. Sad. Keep us apprised of anything you hear that might help, like an an effective anti-borer spray or a resistant strain. BTW, I have planted three black gum trees in our pastures over the past four years, with no success. 6-8′ tall, beautiful trees began to lose leaves the second year and were dead the third year. Have you had success with this variety? Denman, thanks for your comment and question. I have not planted black gum. You say in your pasture? Is it in a shelter, and do you eradicate the tall fescue? Always appreciate your thoughts and comments. Ash is a preferred site for morel mushrooms, along with older apple trees. Losing one species has a profound impact in more ways than we imagine. Thanks, James. And thanks for sending your information about the mushrooms. Indeed, profound. 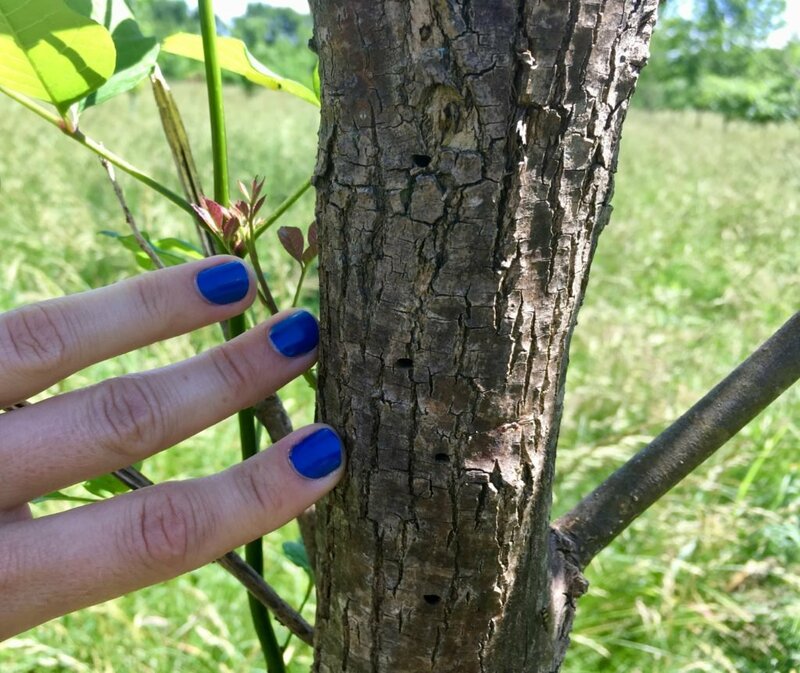 There is some potential resistance in ash in the very few that survive EAB.https://www.fs.fed.us/research/highlights/highlights_display.php?in_high_id=810 Jennifer Koch with US Forest Service is leading some work to develop some genetically resistant native types that shows great promise. Current funding is limited, and at best it will be some years before stock would available, but it could be much faster than for chestnut. A couple of the biocontrols are getting established, and also may be able to help long-term, but aren’t dense enough to help with ash survival today. Anne, thanks so much for this great information. It is certainly encouraging. I wish Jennifer and you, much success. I always read your great, inspiring articles but haven’t responded to date. Sorry to hear that EAB got you all down there. I’m in central Baltimore County, MD, and EAB came in here a few years ago. I’ve had a few trees succumb and was monitoring others in several locations. Suddenly this year those other trees (12-20″ dbh) were filled with the exit holes and were mostly barren except for some lower trunk sprouting. Unfortunately most were not high quality or good form, so they are giving me a lot of exercise in retirement with my saw (but they will hopefully keep us warm in winter!). Don, it’s good to hear from you. Thanks for posting your comment and I hope your retirement is going well. We had such a grand time aboard First Light. You are indeed a gracious host, superior scientist, and great champion for the waters of the Chesapeake. I like Oaks, especially Quercus alba. Good morning Bobby. TESTING THE COMMENTS SYSTEM. Don’t even want to talk about how many ash trees we lost here on our farm. Bill, thanks for your comment. Sorry about the loss of your trees.